The Halloween Special in Florence 2018: our selection with dinners, events and parties on October 31st. 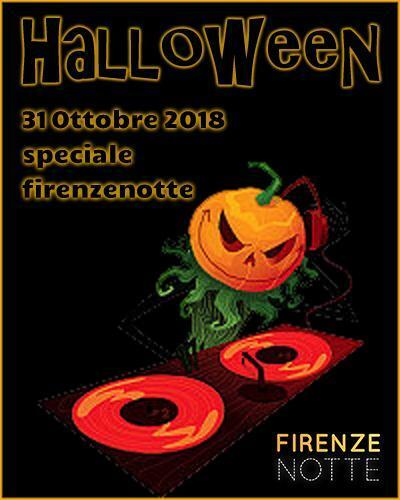 Also this year there are numerous events for Halloween night in Florence ... here are some ideas for the evening of October 31, 2018. Also the Terrazza Twist Martini offers an aperitif with dinner buffet and followed by DJ sets with house and commercial music. Terrace Twist Martini, with a whole new look, is located less than a minute from the exit of south Florence, adjacent to the disco Otel. The restaurant has a large and free parking. Aperitif with buffet starting from 7.30 pm onwards, until about 10.30 pm. Following dj set with disco music. The Otel offers Halloween Party / Voodoo Night . The Sign of the Deep, the Spirit, one of the most ancient religions wrapped in mystery. OTEL is tinged with Voodoo, an ancestral magic on a Halloween night in which to sleep would be a serious mistake. 3 Slopes, 3 Styles, 1 Great Night of Pure Fun. Polish shoes, order the bow tie and iron the clutch bag, Saturday night OTEL is this! A night with a cosmopolitan flavor, where the best musical selections will warm your soul up until the first light of dawn. The Space Club Halloween Party , historical and huge disco in the historic center of Florence, offers an evening with entertainment, special effects and themed installations. All ' Antico Spedale del Bigallo, DINNER WITH DELICATE! On the occasion of the Night of the Witches, Criminal Theater, in collaboration with Attouno, and Antico Spedale del Bigallo are pleased to invite you to DINNER WITH DELICATE ... REQUIEM OF A LOVE (zombie evening in medieval setting). DINNER WITH SHOW € 40 all-inclusive, children up to 8 years 50% discount, vegetarian menu available on request. At Yab Disco Club: HALLOWEEN ... THE NIGHT OF THE WITCHES !!! Do you want to live one night savoring the sounds and the atmosphere of Ibiza? So you do not have to miss the appointment to be held on Wednesday 31st October at YAB. "Ibiza Party" is the most glowing event in the Universe! Admission to the list from 11.30pm to 01.00am, € 10 for women with drinks, € 20 for men with drinks, tables by reservation. For Halloween at the Rubaconte Restaurant and Pizzeria buffet unlimited + 1 drink at 10 Euro , and follow the Chupiteria! At Calistro Bistrot Wednesday 31st October it's not just Halloween , it's the prelude to a new scary menu! We have chosen this day to launch the new menu that, between the seasonality of ingredients and the recovery of ancient Casentino recipes, will make you discover completely unexplored flavors. Live music by Bagno Turko and, above all, the new Calistro dishes: true protagonists of the evening, which you can taste exclusively, just this Wednesday! At the restaurant 50 Sfumatura di Gusto, for Halloween, a set menu dinner including drinks and welcome drinks, excluding wines and coffee ... Theme menus, and for those who wear a mask the most beautiful costume will be rewarded. Price 35 euros Adults. At the Limonaia of Villa Strozzi for Halloween Lattexplus brings to Florence the Peggy Gou phenomenon , the youngest Korean artist to establish herself on the Berlin sceneWednesday, October 31 at the Villa Strozzi Limonaia the star of the house music that has conquered the most sought-after consoles in Europe. At VIRGIN ROCK PUB, the VIRGIN ROCK HORROR SHOW IN HORROR BEATLES NIGHT !!! 6:30 pm to 9:30 pm unusual aperitif with an unusual buffet, even for vegetarians, at only Euro 4.50a, follow 22:00 - 24:00 evening dedicated to the bit generation ... THE LADS in the beatles night !!! Now a must, a party that is repeated from year to yearMostra, witches and many surprises await us! From 8.30 pm onwards monsters, pumpkins, atmosphere, witches, but above all a wonderful party! At the Villa Medicea La Ferdinanda: WITNESS VILLA 2018 V edition . HALLOWEEN for FAMIGLIE itinerant theatrical performance by I Viaggiatori del Tempo. At the Cycle of Calenzano, the only theme party THE CARD HOUSE ! Are you ready to enter the State Mint? Individuals with machine guns, all red and strange Dali masks have been holding the State Mint since days, you can decide whether to join the gang or claim your freedom by remaining a poor hostage. THE FIRST 100 INPUTS WILL RECEIVE DALI 'MASK FREE. If you have read the article up to here, you may be interested in following Firenzenotte on FaceBook to be updated on the evening events of Florence. To get more ideas on how to spend the evening of Halloween, in the calendar on our home page you will find all the Halloween events in Florence for October 31st. The calendar of our events is constantly updated so we suggest you return to consult it until the evening of October 31 ... before wearing the mask !! !